Diabetes is a condition in which the amount of glucose (sugar) in the blood is too high because the body is unable to use it properly. This is because insulin is lacking or the body’s way of making glucose into energy is not working properly. is also known as insulin dependent diabetes. This usually starts in children and young adults. People with this type of diabetes require daily insulin injections. is the most common and usually affects people over the age of 40 years. Your feet are supplied with blood to keep them healthy. They also have lots of nerves as a warning system. For example, if you have a stone in your shoe, nerves will send a message to your brain. Nerve damage may mean that you no longer notice the stone in your shoe, due to loss of feeling in your feet. This could then lead to an injury you can’t feel, and possibly infection. If you have poor circulation, any injuries or infections to your feet (ie cuts, burns or scratches) will take longer to heal. This is due to less blood flowing into your feet. Blood provides energy to muscles and aids in healing any tissue damage. 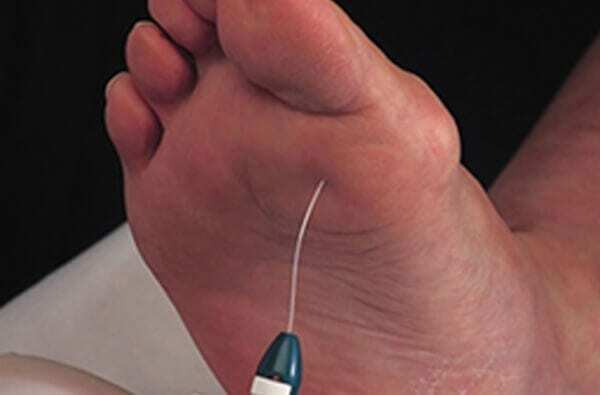 Most foot problems in people who have diabetes occur when injuries – and often infections – go unnoticed and untreated, or when healing is delayed due to poor circulation. A six monthly check by your podiatrist will help to detect any changes early – before they become a problem. Your podiatrist will examine your circulation by feeling foot pulses. They will also examine sensation by testing reflexes, vibration and pressure sensitivity, and other tests may be conducted as necessary. In addition, they will also look for general foot conditions which may lead to future problems. Your podiatrist will work with you to show you how to monitor your own feet, in between consultations.